Is there a fix for broken Journal Entry Inquiry links? 1. Is there a fix for broken Journal Entry Inquiry links? Occasionally, when doing a Journal Entry Inquiry, I will click on the Source Document and it does not link to the correct source document. I have seen this happen most often on payables with deferral entries, but not always. Is there a utility or job I can run to fix the link between journal entries and source documents? That JE lookup link saves a ton of time, when it is accurate! 2. RE: Is there a fix for broken Journal Entry Inquiry links? Subject: Is there a fix for broken Journal Entry Inquiry links? 3. RE: Is there a fix for broken Journal Entry Inquiry links? Our team ran into this as well. We found it to be a bug with Revenue Expense Deferrals. If you use deferrals or if it is enabled you could test this by disabling the code and trying to drill to the source doc -- Disabling a dictionary in this window only effects the Dynamics instance you do it in, and it will default back to enabled when you log out and back in. 4. RE: Is there a fix for broken Journal Entry Inquiry links? Thanks Ken - that's the problem - as soon as I disabled the module like you showed, drilldown worked correctly. Guess I'll just have to wait along with everyone else until Microsoft fixes it. At least I'm glad to know it is not a db problem! 5. RE: Is there a fix for broken Journal Entry Inquiry links? 6. RE: Is there a fix for broken Journal Entry Inquiry links? I would definitely check out the Revenue Deferral module bug mentioned in a response, but if you don't have RED installed, or that ends up not being the issue, you can try running check links on your GL tables to see if it restores the link back to the originating document. If that doesn't work, you'll have to investigate in SQL. 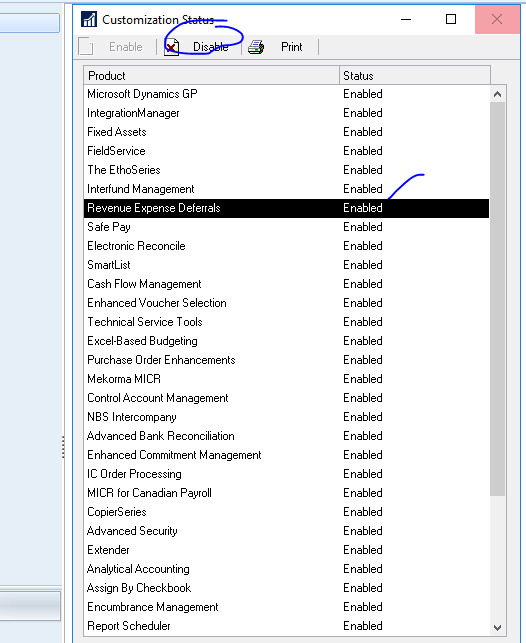 so you can do a select * from gl20000 where sourcdoc = 'PMTRX' to see all the payables transactions that hit the GL. If the sourcdoc and the ocrtrnum in your GL for those journal entries is missing, you'll need to populate them, linking back to the voucher number in AP or whatever module you're missing the link from. 7. RE: Is there a fix for broken Journal Entry Inquiry links? Thanks Rob - it looks like the RED error. However, I did find a report under Maintenance, Check Deferral Links. I ran this for all systems and no errors were found, which was a nice reassurance. 8. RE: Is there a fix for broken Journal Entry Inquiry links? When RED is enabled, the system tries to look at only the GL20000 (Open) table. If the Journal Entry you are drilling down to is posted in the current, open year it will work. The problem is when you are attempting to drill down on a historical year, since those transactions are stored in the GL30000 (History) table. As mentioned in other posts, when RED is disabled it works because the system then checks in the correct table, either being GL20000 or GL30000. 1. Temporarily disable RED in the Customization Status window (this will only disable it for your user). I would not recommend this route, since it can be easy to forget to re-enable RED. 2. Use Smartlist to drill down to the Source Document from the Journal Entry. From here you can double-click on one of the Account Transaction lines and the Transaction Entry Zoom window will open. From there you can select the Source Document field to drill down to the original Source Document transaction. 9. RE: Is there a fix for broken Journal Entry Inquiry links? Thanks Samantha - that smartlist is a great alternative until Microsoft can fix it properly!